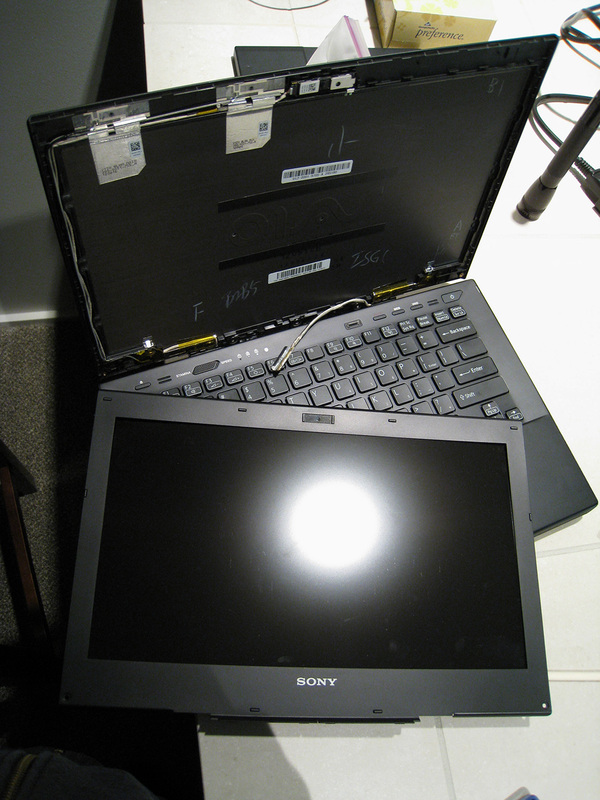 Discussion in 'VAIO / Sony' started by prone, Feb 17, 2013. This thread outlines the procedure to swap out the stock VAIO S (SVS13A290X) 13.3&#8221; 1600x900 TN LCD panel with an LG 13.3&#8221; 1600x900 IPS LCD panel (model LP133WD2-SLB2). 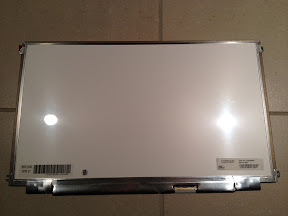 Purpose : The quality of the stock TN panel (Chimei Innolux model N133FGE-L31) is disappointing, at best, due to its low viewing angles, harsh blue tone, low saturation, low contrast ratios and grainy anti-reflective coating. 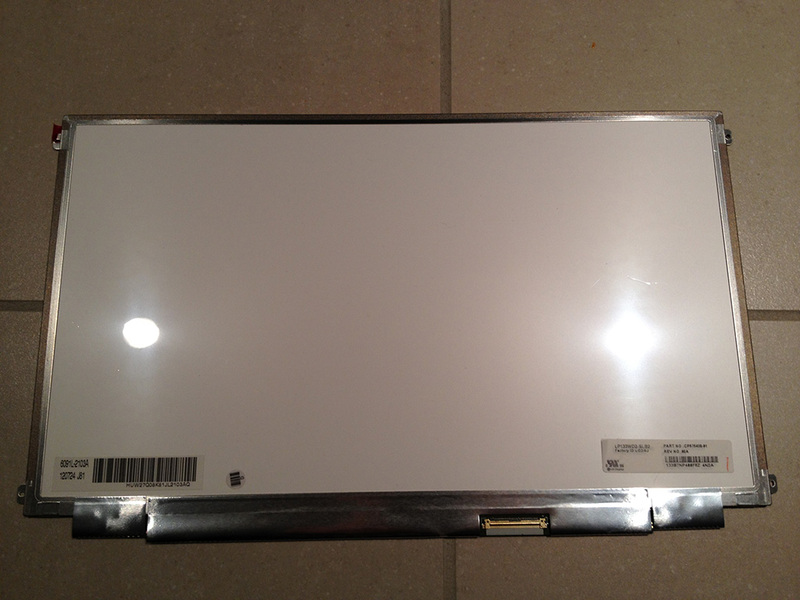 This is an attempt to replace the display with a better quality IPS panel. Here we go. First you will need to purchase the new display panel. I bought mine off Ebay, your results may vary. The LP133WD2-SLB2 has a 40-pin dual LVDS connection on the lower-right portion of the panel, when viewed from the back. The connector matches the stock display, so no need to modify the cable (I wouldn&#8217;t have known how to do it anyway). There are different models of the display and at least one other user (wwiktor) has used another version successfully in this mod (LP133WD2-SLB1). There are portions of the panel&#8217;s circuit board that will need to be cut because it is too wide to fit the bezel&#8217;s cavity. 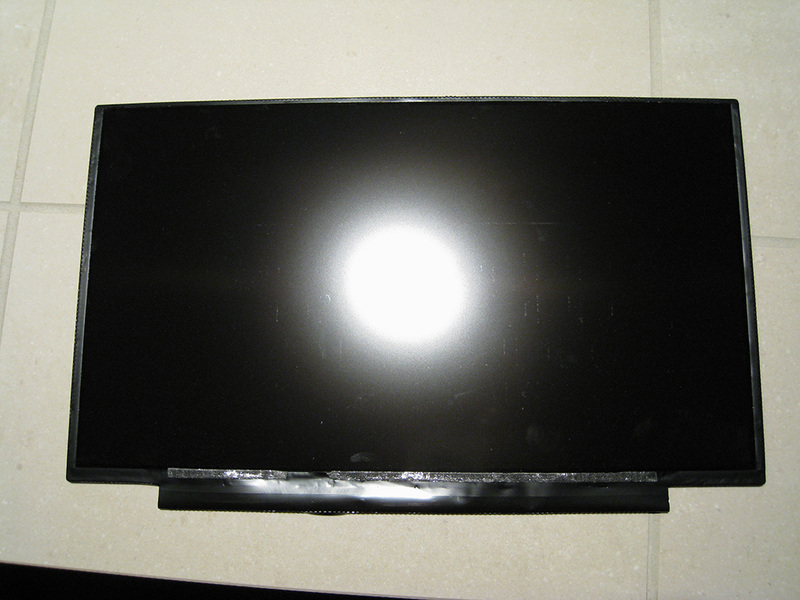 Update (4/20/13): The LP133WD2-SLB1 fits much better in the original display cavity, so a lot less cutting is needed. When available, purchase the SLB1 instead of the SLB2 and most of the work will be done already. I will not detail the procedure to open up the body of the S13. That might be in another post. You can follow almost the exact same procedure as in wizzardxexe&#8217;s post here. 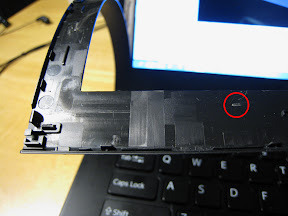 Make sure you disconnect the battery and power adapter before you open the laptop! 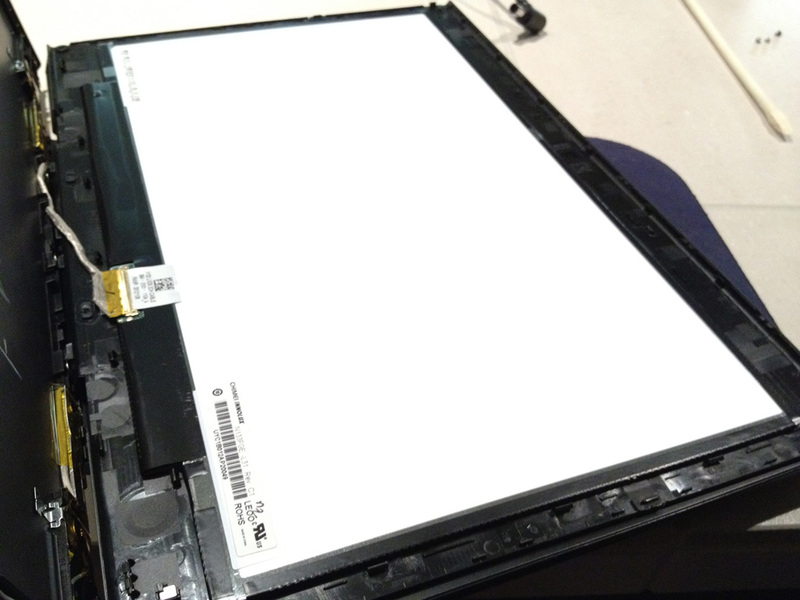 Get at least to the point where you have the keyboard assembly removed, then work on the bezel. 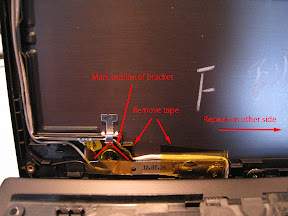 The bezel can be opened without full disassembly of the laptop by unscrewing two screws on the bottom left and right of the display, underneath the rubber pads. 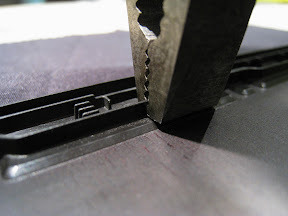 Using a wooden or plastic spudger, you can carefully pry open the bottom of the display first, then free the bezel working your way up using inward pressure to free the clips along the side and upward pressure to free the clips on the top. The front portion of the bezel is attached to the original panel with a thin strip of adhesive along the bottom of the screen. Carefully pull the 40-pin connector straight out of the socket and the bezel/LCD unit will be free. Separate the bezel apart from the LCD slowly to release the adhesive. 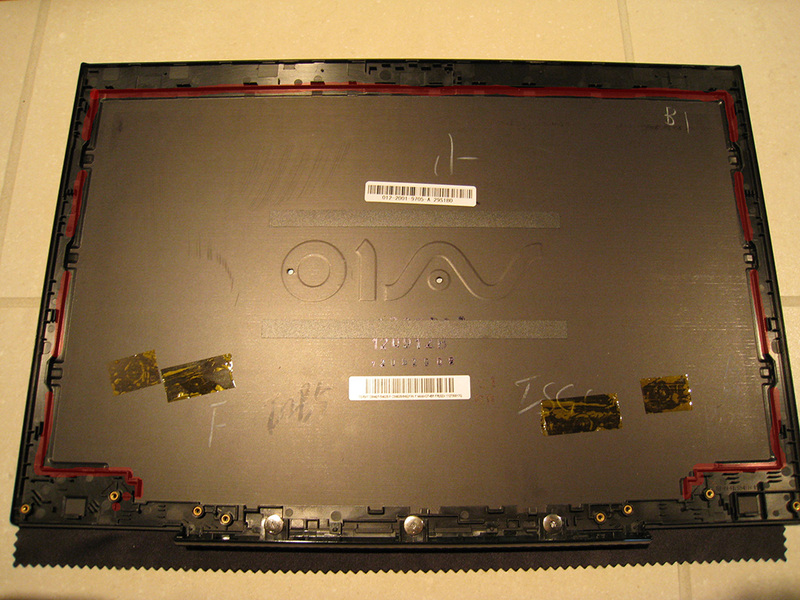 The carbon-fiber back portion of the screen can be removed by unscrewing the six large-headed screws on the hinges. Draw an outline of the metal hinge on the carbon fiber panel with a permanent marker before you remove it from the body. 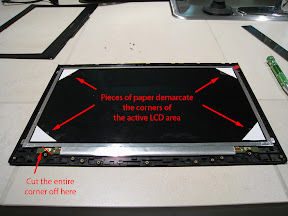 This will remind you where to cut the new lcd panel. The wifi antennas peel-off and the webcam just pulls straight out. You can use this opportunity to connect the new panel to the display cable. Plug in and turn on the computer to see if it works properly. You&#8217;ll need to reassemble the keyboard assembly if you want to fully boot into your OS. If everything looks good (check for dead/stuck pixels, orangegate), you can proceed to modifying the back panel. Once the back portion is removed, place it flat on your workbench and start removing the raised &#8220;frame&#8221; that used to hold the old LCD panel in place. You will need to remove everything highlighted red in the picture. 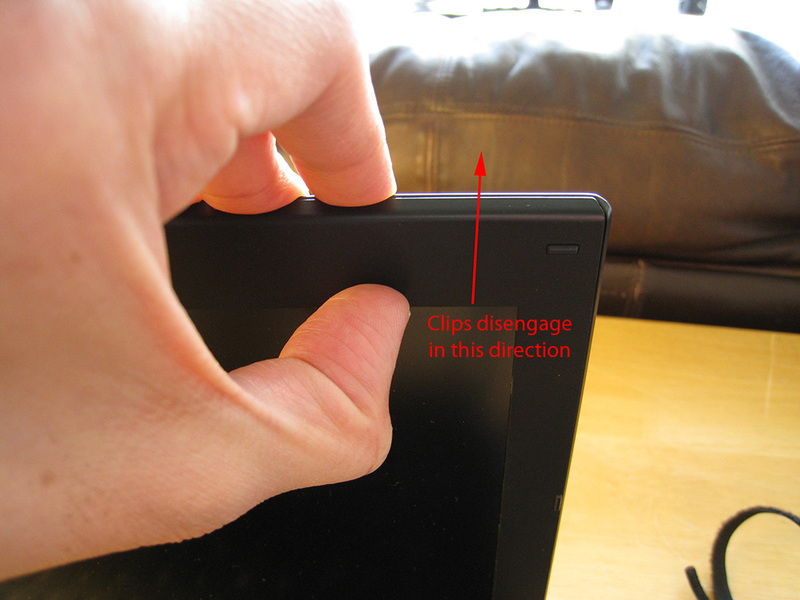 You do not want to remove the &#8220;standoffs&#8221; that are used grab the bezel&#8217;s clips. They will be used later to hold the new panel in place. I thought that I could sand-off the frame with a dremel cutting wheel, but the carbon fiber &#8220;melts&#8221; from the friction. I ended up just taking a pair of pliers and grabbing the frame in its teeth while rocking it back and forth to break it off like how metal fatigues under stress. The rest of the frame can be whittled away with a sharp X-acto knife. 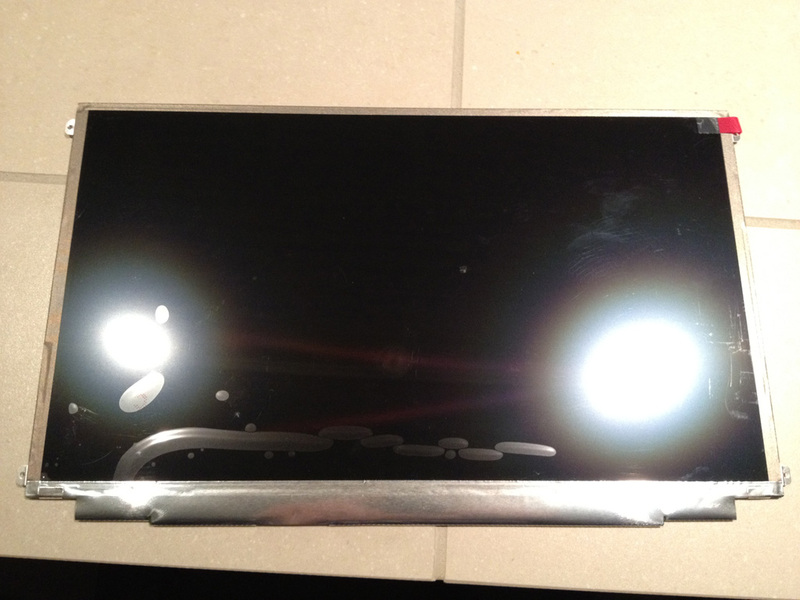 The new LCD will sit on this surface, so make sure it&#8217;s level all around. 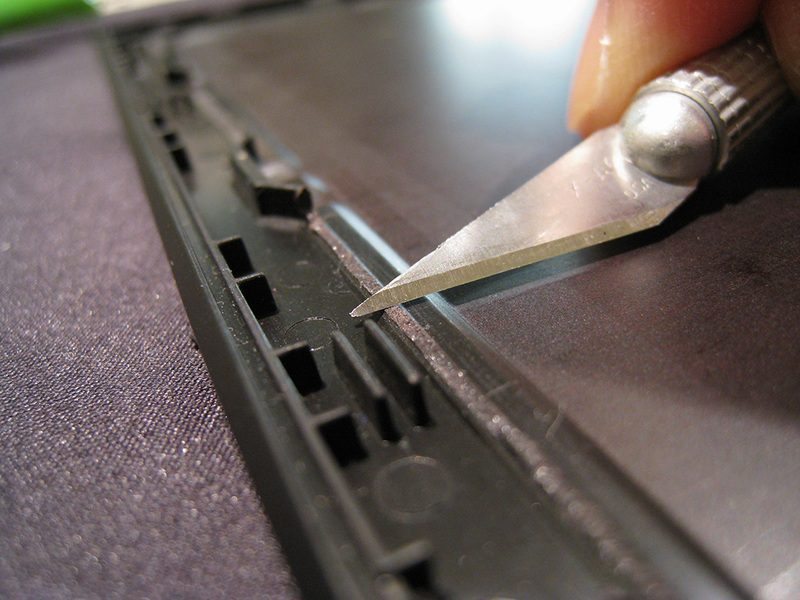 Carefully cut and remove the foil from the bottom left and right portions of the LCD circuit board. You will expose the portions of the board that will need to be removed. 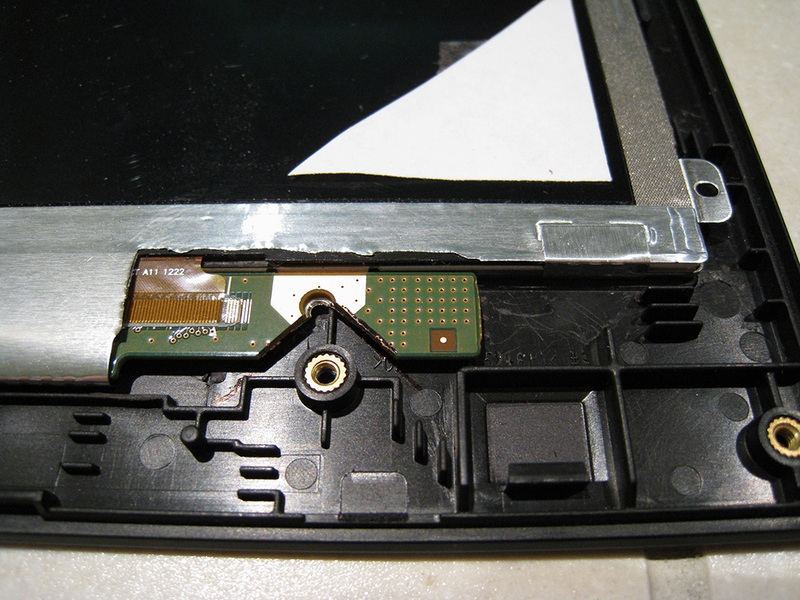 Thankfully there is no active circuitry in this area, it&#8217;s just all grounding and the screws are for strain relief. Unscrew the two screws that hold the board in place. They will not be needed anymore. 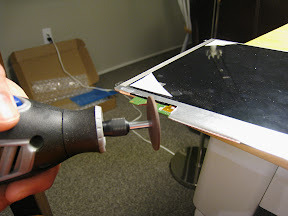 Now lay the LCD panel back in the carbon fiber backing and use the marks you made earlier around the hinge to mark the portion of the circuit board you need to cut. You will need to cut either a triangular shape off of the circuit board to make it fit around the hinge or just cut off the whole edge at a diagonal, following the top side of the hinge. 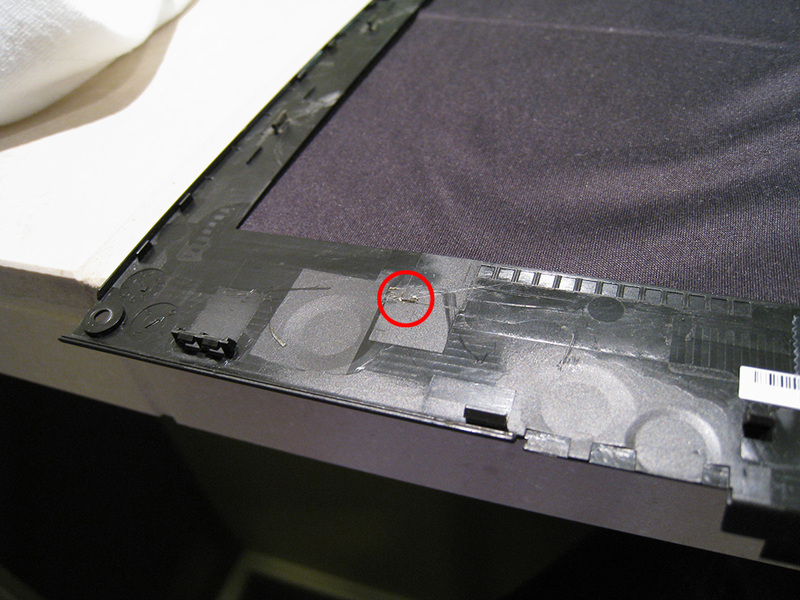 You will need to cut off a diagonal on the left side of the panel to allow the rerouting of the webcam cable. The next step is to release some slack in the display cable since the connector on the new LCD is further to the left side of the bezel. 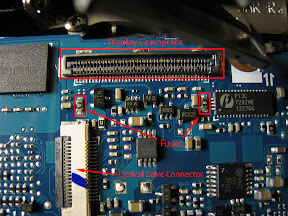 Begin by disconnecting the cable on the motherboard end. Pull the plastic tab on the connector straight up and it should snap off. Hold the motherboard down with your other hand because it takes some force to pull the cable off. Now you need to free the motherboard from the laptop base. You will need to remove the optical drive first, then eight screws outlined in red. After doing this, you can carefully lift up the motherboard from the fan, just enough to release the display cable from underneath. Pull up on the display cable as you gently lift the motherboard up. You don&#8217;t need to take the whole motherboard off (there are other wires that prevent you from doing this). Pry off the plastic clip that sits on the hinge and the cable can be fully released. 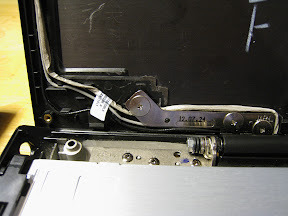 Adjust the length of slack necessary to reach the display connector, then place it back into the hinge and underneath the motherboard. 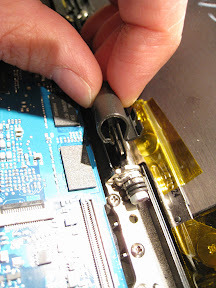 Snap the connector back into the motherboard and replace the plastic clip. 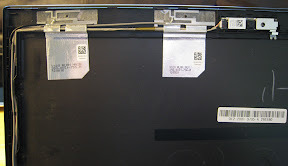 Re-attach the WiFi antennas and webcam and route the cables in their original positions on the back display frame. 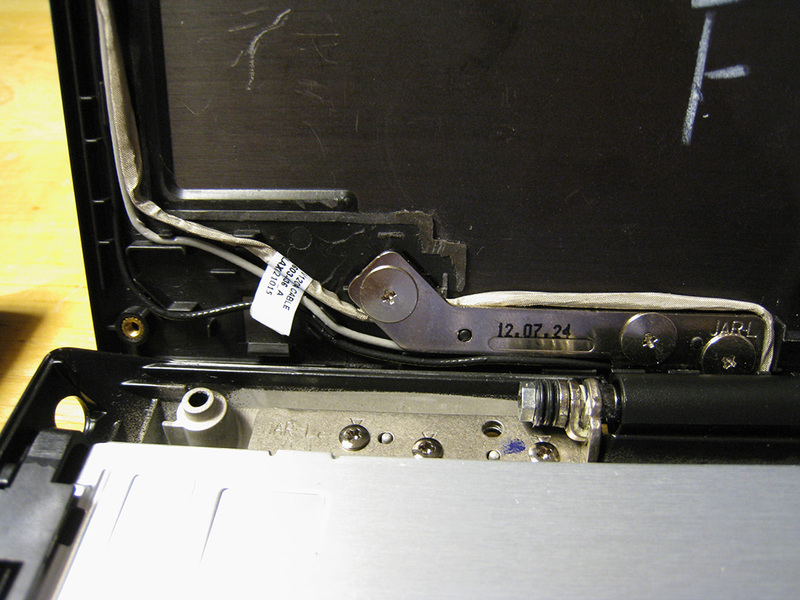 Here is where it gets tricky because you have to reroute the webcam cable underneath the metal hinge while re-screwing the back frame on. Check and see if there are any other portions of the frame that need to be cut off in order to do this properly. After you have the back frame screwed in, connect the display to the LVDS cable and set it in place within the back frame. The portions of the circuit board you&#8217;ve cut out should match the contours of the hinge. On the plastic bezel, there are clips along the sides of the frame that formerly engaged with the &#8220;standoffs&#8221; you cut in the display backing. There is not enough room for these clips to engage anymore because the LCD panel is wider than the original. 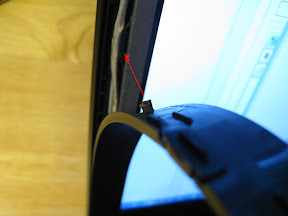 You can still use these clips to somewhat secure the sides of the bezel to the display backing, however. 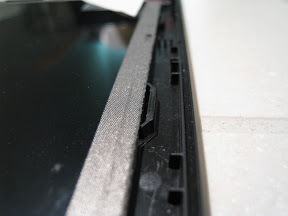 Use a Dremel sanding wheel to shave down the clips so that they are thin enough to fit in the small gap between the standoffs and the LCD panel. 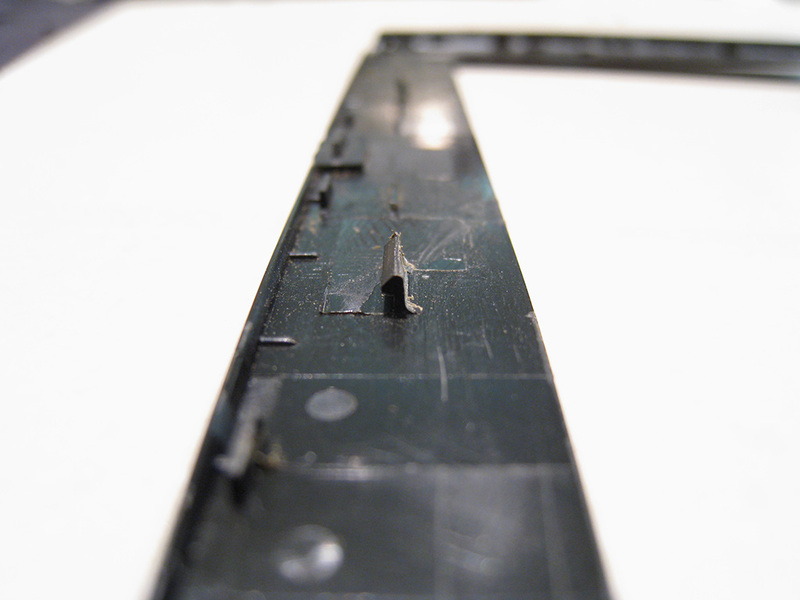 There are also some clips along the bottom edge and top edge of the bezel that need to be cut off with an X-acto knife. After you&#8217;ve done a dry fitting and everything seems to fit with no bezel-bulging, secure the LCD to the back panel with double-sided tape. 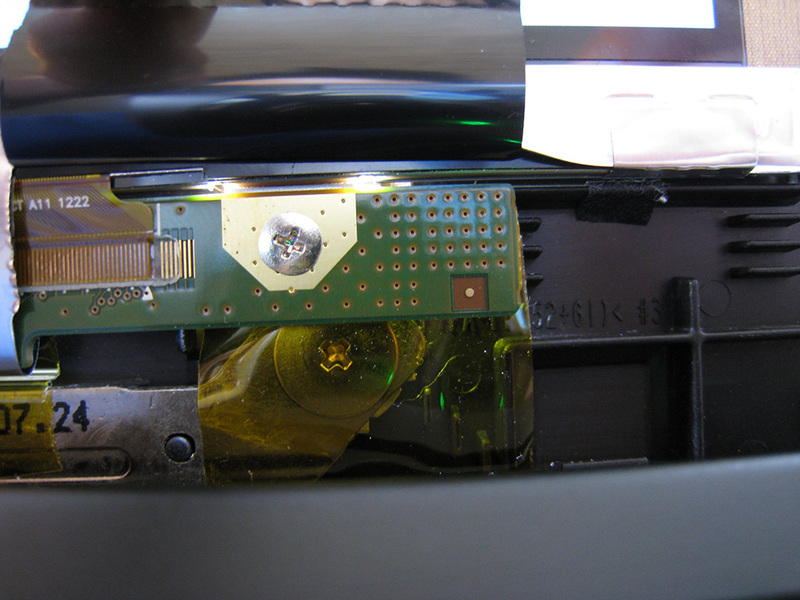 Then place some double-sided tape along the bottom edge of the LCD screen, just like on the original LCD. Snap the plastic bezel back onto the display backing, starting with the bottom and work your way up. Remove the protective plastic film that covers the new LCD display before snapping the bezel back on. Reassemble any remaining parts and confirm that everything functions correctly. If you happen to hook up your display and the backlight ceases to work, then you may have forgotten to disconnect the battery and power cable when you disconnected or replaced the LVDS cable. 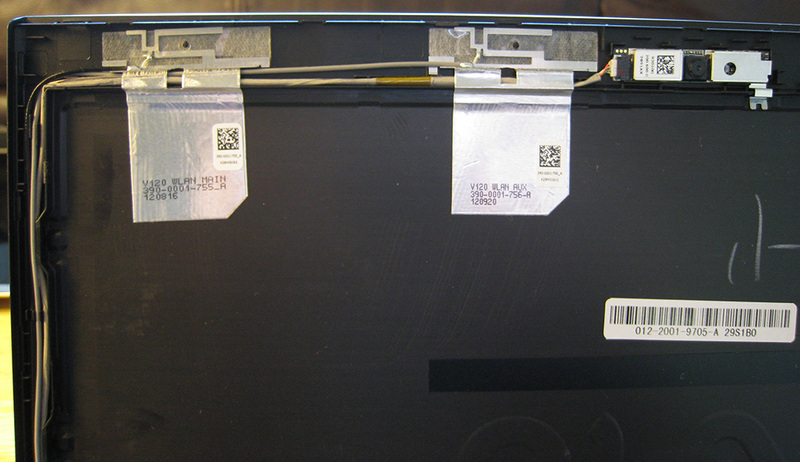 The following images show the location of the fuses which may have blown during the process. Either replace the fuses or just bridge the connection with some solder to get the backlight working again. Extremely impressive ! Thanks for the detailled walkthrough ! Impressive work! 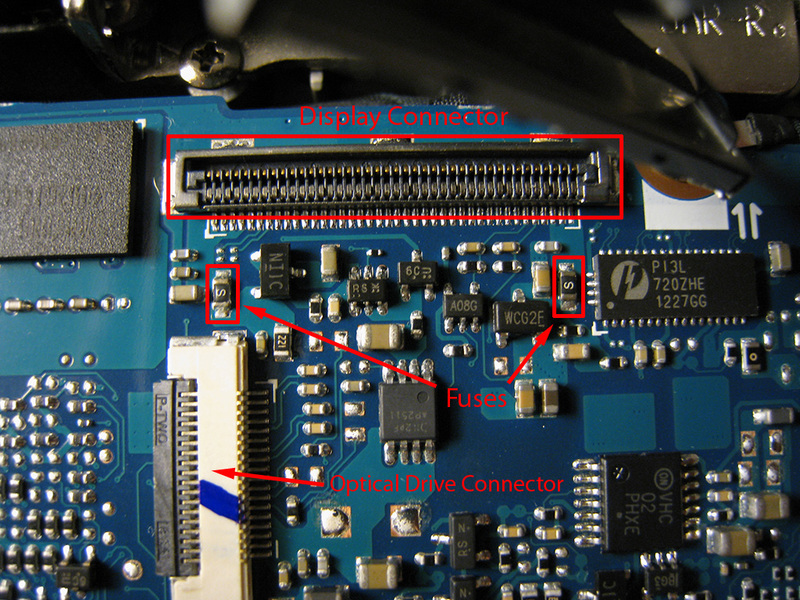 Do you happen to know the part number of your LVDS display cable? 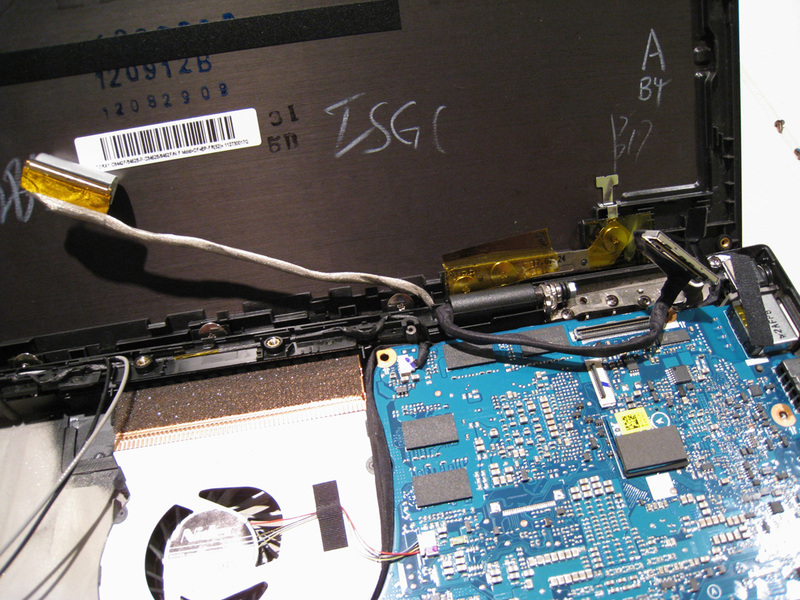 I'd like to perform a similar mod to a VPC-SB series laptop, which comes with a 1366x768 screen and it most likely comes with a single channel LVDS cable (so that would need to be replaced as well). Thank you so much Mr Prone!!! 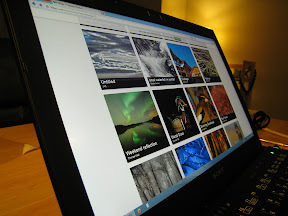 This is for sure a great guide! I have a question, though. Do you think same replacement could be done with the basic 1366x768 screen? 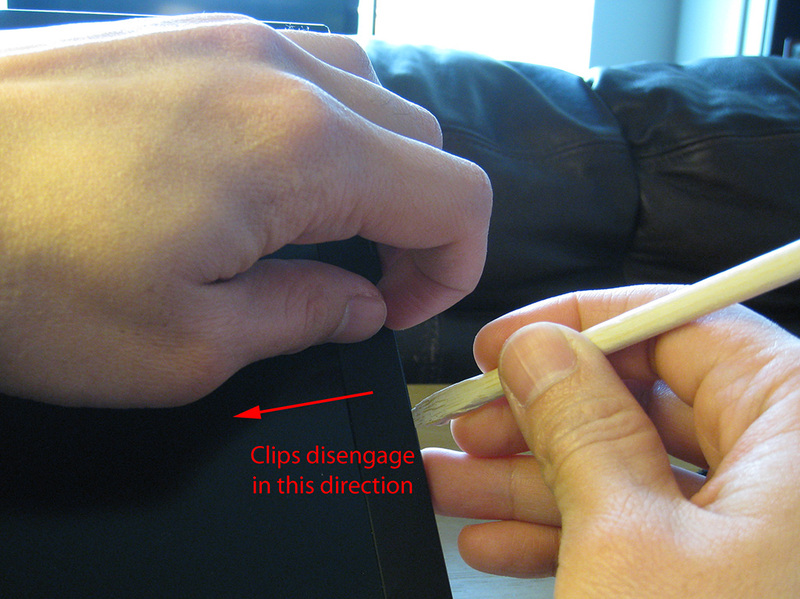 I'm hesitant to try, because it's obviously different for low and high res. screens. I want to try it so bad, but I'm hesitant the computer simply won't accept a higher resolution? Do you have any info on that? 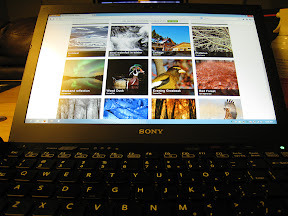 How does Vaio Z screen fits in there? 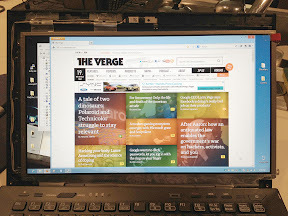 It's 0.2 inch difference, I have an opportunity to buy a Vaio Z 1980 x 1080 display. but I would not be able to return it if it doesn't fit, so I don't really know if i should take the risk, the display obviously is pricey. I just found out that the replacement part number is V030 LVDS 2CH CABLE (A1841202A) and the existing is V030 LVDS 1CH CABLE. 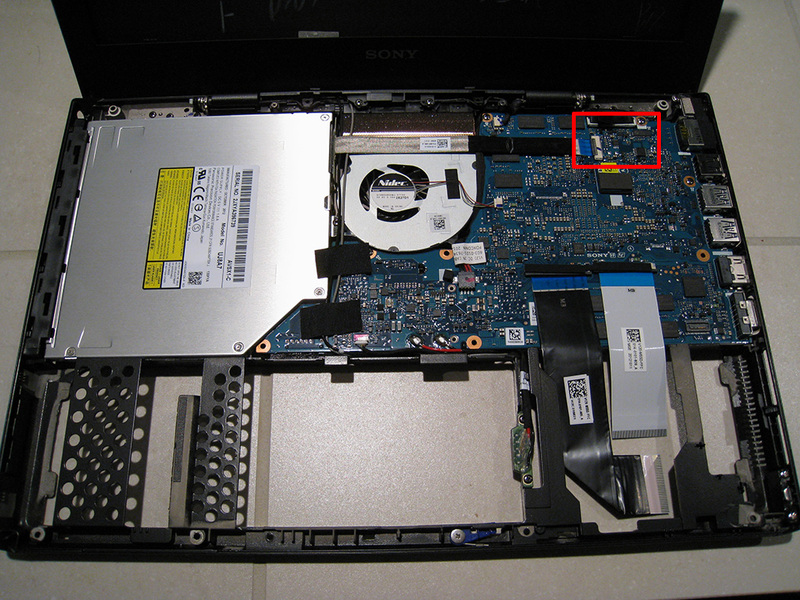 But the service department of Sony Europe (after requesting the S/N of my laptop) informed me that they are not allowed to sell a different replacement part than the one that the laptop is originally equipped with! This means that unless I find something on e-Bay I have to stick with the lousy stock TN panel. 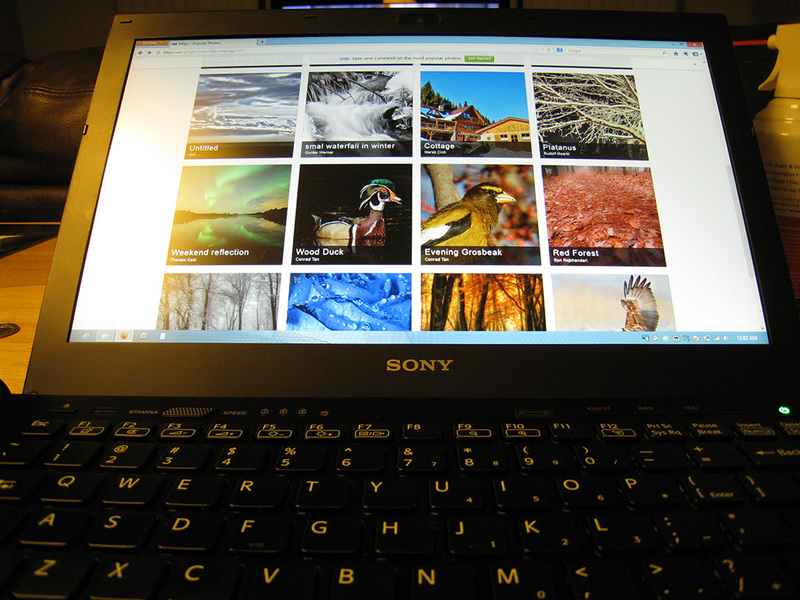 I think I had enough with Sony, I am switching back to Lenovo for next purchases. To my experience, they have much more open policies on their hardware. So who's gonna IPS/VA mod the Z Series? Now who is going to put his hands on the screen in this beauty and put it in their S13P. 13,3" Full HD and probably IPS too, going by the 350 nits brightness and 178 degrees viewing angle. This panel costs $150 retail. Why doesn't Sony put this in the next S and charge a $300 premium? I would gladly pay. It would turn the S into a worthy successor to the Z.
I just found out that the replacement part number is A1881581A (V120 LVDS 2CH CABLE) and the existing is A1881698A (V120 LVDS 1CH CABLE). 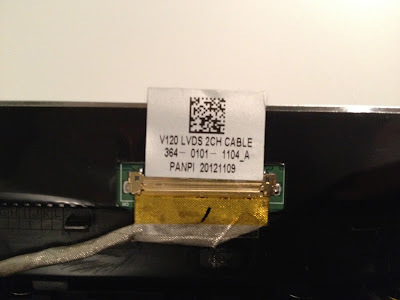 Here's the label on the LVDS cable. It's a highly custom-made cable. There's absolutely no strain relief on this cable except for the flimsy metallic grounding tape they coat the thing with. Make sure you grab the tape firmly and pull it straight out to prevent damage. I doubt you could just replace the 1 Ch cable with the 2 Ch one and expect the 1600x900 display to work on a unit designed for the 1366x768. Wouldn't the laptop side have to be wired differently? I'm surprised Sony even gave you the actual part number! Good detective work, though.